Last June, Samaras was proudly showing off his generosity. 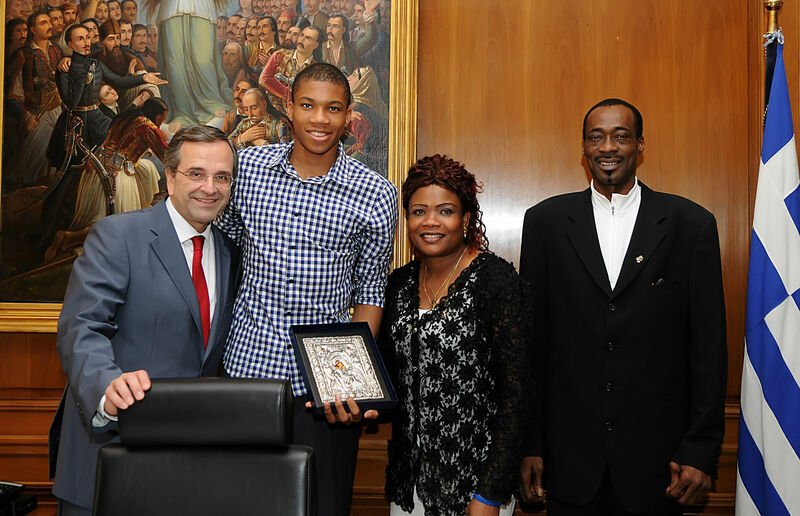 Although Giannis Adetokounbo was already granted citizenship behind the scenes, Samaras saw his chance for a classical political trick. While surrounded by cameras, Samaras pretended to give Giannis his desired citizenship from his hands personally. Meanwhile, he extensively complimented Giannis for his extraordinary basketball performances, a sport so popular throughout Greece. Samaras emphasized how proud Greeks should be to have this new citizen among them and how “others” seeking citizenship can take an example from Giannis’ formidable behavior. With an orthodox icon in his hand, Giannis could now leave the building. We can do nothing more than be happy for Giannis, who now is enabled to pursue his ambitions and dreams. Or can we? I think we can and should go beyond being happy for Giannis and thankful towards Samaras. Beside the fact that we should realize the fakeness of this act, we should try to make sense of what all this is about. We should not recoil to criticize this theatrical performance, but instead try to grasp the underlying contradictions in the ND approach to citizenship, revealed by this ridiculous media circus. Before going deeper into the debate, let me be clear first: Giannis does deserve a Greek passport, there is no doubt about that. Moreover, I am incredibly happy that his dreams now can be realized and that his parents can be very proud. My aim is not to put in question anything related to his recently acquired citizenship. My aim is to challenge you to think beyond the theatre and reflect upon the problematic and paradoxical performance of Samaras, his emphasis on Giannis’ indisputable behavior and extraordinary sportive performances, on the basis of which Giannis, according to Samaras, “deserved” his citizenship. The problem lies exactly in this conditionality. It namely assumes that citizenship is something accessible only for those who are talented. This immediately raises the question: what kind of talents would suffice the requirements for citizenship? And do or should we appreciate particular talents over others? Which one should be linked to citizenship? Every child is blessed with a unique combination of qualities, so how should we categorize and value these? The irony comes in when we apply the same question to people without arbitrary access to citizenship: do they hold talents that are linked to their legal status? No, certainly not. Bottom line is, children of migrant origin often are granted citizenship when they contribute to society in a way that is noticed and considered desirable by a wider public. Sports is the most well-known example. We should not be silent and pleased by Samaras’ apparent “generosity”, but open our eyes to the contradictions underneath his symbolism. Instead of viewing his actions towards Giannis as friendly (as the pictures in the new papers presumed) we should try to translate Samaras’ message about citizenship and see that he preferably and actively promotes it as a tool for inclusion while in reality it is applied as a tool for exclusion. Samaras confirms the ideas that so many people hold about citizenship: that it should be something conditional. Of prime importance are the conditions such as a good understanding of the language, absence of illegality, no criminal record and a good (working) ethos. Preferably, the person should know the history of the host country and apply the ethical values of society. It is often assumed that there is a common consensus about all these conditions in host society while they are still subject of heated debates, proving that there are different ideas about to what extent the conditions should be met. So, the conditions themselves would certainly deserve deeper inquiry as well. By all means, we can conclude that the existence of a conditional idea about citizenship, makes it a powerful tool of exclusion: those who do not meet the requirements are denied rights and participation in society. It defends the country from undesired individuals who can threaten national security or mess up imagined cohesion. Besides the simplistic application of these conditions, there is a striking inconsistency in Greece. On the basis of these requirements, most second generation migrants should be granted citizenship immediately. Obviously, given the fact that they are exposed to Greek language, history, culture and values throughout their lives, they automatically fulfill the conditions that so many people link to citizenship. True, due to the endless bureaucratic procedures some have experienced a period in limbo, but this often happened beyond the scope of their responsibility. It thus seems as if the current government considers itself trapped in its own standards: granting to all the 200.000 children Greek citizenship would be a very unpopular measure, certainly given the countries’ sensitivity towards questions of belonging, now that it faces its worst economic decline since WWII. Samaras thus needed another requirement that would facilitate exclusion and please multiple stakeholders at the same time. The case of Giannis painfully offered him the perfect mask. Knowing that the media would broadly report about this topic (given both the heated debate surrounding citizenship and the popularity of basketball) Samaras falsely utilized this perfect case to send two important messages. Firstly, he wanted to clarify “we are not racists”, meaning “we are aware of the problems and positively navigating towards a solution”. This message was meant to please the first stakeholders: the fathers and mothers of children who face enormous problems because they are denied citizenship. They were offered “hope” and asked to be patient again. “Seriously, we are sympathetic and trying!”. The second message was “we should be careful who to grant citizenship to”. Indeed, we can grant it to Giannis, because of his extraordinary talents that might come in useful; someone who we can be proud of to be called “Greek”. Moreover, he can be an example for all the others who are seeking citizenship. And this is exactly the core of the problem: not every child of migrant parents is a talented basketball player. By just adding this subtle condition, Samaras turned citizenship in a tool of exclusion. The combination of these two messages are deceptive and fallacious. It intends to appease different stakeholders in the debate and therewith salve the difficulties involved. Desperate parents and children of migrant origin are asked to be optimistic, because “the impossible appeared to be possible“. Simultaneously, Samaras satisfies that very segment of Greek society which now is so sensitive to issues of citizenship and belonging by saying “don’t worry, only those like Giannis will acquire citizenship from my hands”. Obviously, thanking Samaras for his generosity will not help the other 200.000 children waiting in limbo. Those children experience the exact same obstacles as Giannis previously did: they are obstructed in chasing their dream, let alone live a normal life. Fortunately, Giannis can serve as inspiration and hope to them, feelings necessary in order to be willing to continue the battle. This stamina is needed in the frustrating Greek context if we want to achieve what Samaras actually tries to impede: accessible citizenship for every child born from migrant parents, instead of conditional citizenship with unrealistic and blurred standards. Regardless of their talents, their potential contribution to Greek society or whatever condition that might be added in the future, these children should be recognized as human beings with their own rights, worthy of dignity and respect. I want to thank Giannis for unchaining this dialogue, I hope it will fiercely continue. All the best in the NBA!